Happy Wednesday! 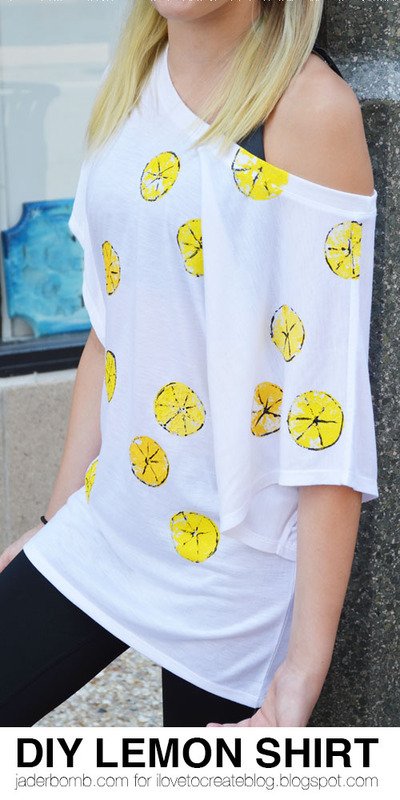 I am so excited to show you how I create this yummy Lemon shirt! It's so bright and refreshing you will prolly want to peel them off and eat them! I have sorta been on a "fruit" kick lately. Seriously, fruits are so much fun to paint especially watermelons. I will say after doing this lemon shirt I am in the mood to do a lime shirt now. I might just have to do one with both! Whatddya say! If you are really curious of the shades I used, they are below. Step 1: Cut a Lemon in half. Step 2: Press each half onto a piece of tissue paper to soak up some of the juice in the Lemon. If you are using a different fruit do the same thing. Step 3: Squirt your paint on a clean surface to use then gently dab one half of your lemon in it. Step 4: Place the half on your shirt then apply a little pressure. Once you are done with all of your lemon spots allow a few hours for the paint to dry completely. You might notice some of the paint will be clumpy or there will be little pieces of the lemon on the shirt. Don't worry, once you wash it, it will go away. Once dry we will then take out our black slick paint to outline our Lemons. Step 5: Carefully outline your lemons. Remember the key is to use a little. We don't want a thick black line. This is what it will look like when you are done. Very abstract! Once you let this dry you are now ready to sport your Lemon shirt! I am super pleased with the outcome. It's perfect for the Summer and kids will love doing this project! You can see how happy my model is! She fell in love with it and it looked awesome with her blonde hair! I hope you enjoyed this tutorial and if you have ANY questions feel free to leave them in the comment section below! Big hugs! Hey! Wanna learn how to spray paint a shirt? Come check it out HERE!